(3) SOUTHEAST SALMON SEINE NETS. TWO ARE FULL SIZE, BUT NOT SURE HOW MANY STRIPS AND THE 3RD IS SMALLER AS IT WAS A COST RECOVERY NET. 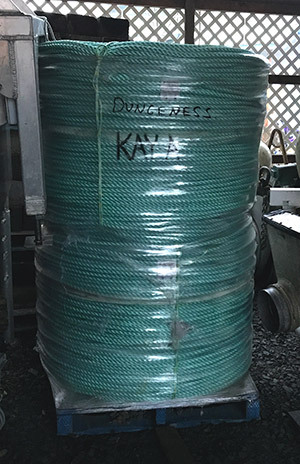 (2) COILS OF POLYSTEEL MEDIUM LAY 3/4 x 4200 FT. STUCK AT 40 FATHOMS FOR 35 POTS DYMAX BECKETS.